© Arthur Levine, 2010. Licensed to About.com. When the original World of Color show debuted at Disney California Adventure in 2010, I was blown away. It took the concept of a monochromatic dancing fountains show, such as the one presented at the Bellagio Casino in Las Vegas, infused it with dazzling color, overlaid a judicious selection of colorful Disney and Pixar animated scenes projected onto water screens, and created a production that trumpeted new technology and heralded a new era in nighttime spectacular shows. 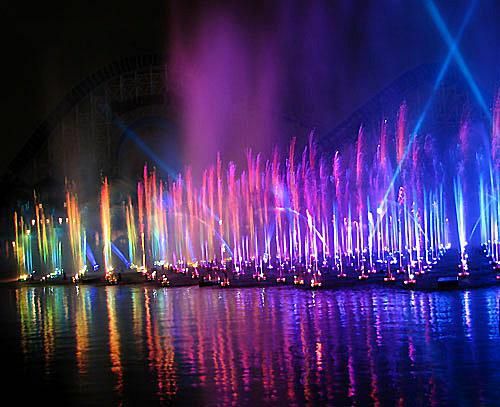 Imagineers designed World of Color so that they could modify the show. Since its introduction, they have added seasonal scenes as codas, promoted film releases by inserting content, and have made other small changes. As part of Disneyland's 60th anniversary Diamond Celebration, however, Disney's creative team traded out virtually all of the original scenes and developed an entirely new show that debuted in May 2015. Now called World of Color - Celebrate, it honors Walt Disney and his legacy of movie and theme park triumphs. While the concept behind the mega-scale fountain show remains audacious, and many of the scenes still blow me away, overall Celebrate doesn't work as well as the original production. By attempting to tell a more linear story and using co-hosts to weave everything together, the show simultaneously aims for intimacy and grandeur. But the two goals are at cross purposes, and they each detract from the other. Celebrate ends up being neither all that intimate nor as majestic as World of Color 1.0. Some of the scenes are a bit menacing and so much larger-than-life, they may scare very young children. Also, the flame effects are quite intense. Fastpasses required for prime "Paradise Park" viewing area. They are distributed early in the day for that night's shows. Guests can also reserve a viewing spot by purchasing a dinner/show package with both table service and picnic meal options available. Info about the packages and how to make reservations is available at Disneyland's Web site. The show can be seen from other (non-reserved) spots around the bay, but they do not offer ideal viewing. Depending on the time of year, one or two shows are scheduled nightly. Based on that day's demand, Disney California Adventure may add a third show. Note that audience members may get wet depending on wind and weather conditions. Disneyland Paints the Night with Glowing Parade - Another Diamond Celebration nighttime spectacular. Disneyland Forever Redefines Fireworks Shows -- with a Bang - Another Diamond Celebration nighttime spectacular. The sheer scale of the presentation remains massive. About 1200 fountains span 120 yards across Paradise Bay and shoot bursts of water up to 200 feet skyward. A water screen that measures 380 feet wide and 50 feet tall serves as the backdrop for the projected film sequences. Dozens of fire cannons fill the lake with intense blasts of heat and light. A slew of lasers mix intense colors into the show. Six technical directors run the whole shebang from a command center that can adjust color intensity, fountain movements, and other show elements using 18,000 points of control. The water screens, subject to wind, humidity, and other atmospheric conditions, can be finicky and lose their integrity. When animated scenes are projected onto them, the occasional lack of fidelity is forgivable. The colors and forms waver and morph, and the resulting stylized rendition can produce intriguing and pleasing results. Live action sequences, however, just look blurry and wrong when the water screens don't cooperate. NPH, a wonderful and endearing performer, can pull off just about anything, but even he doesn't fare well when he looks blurry and wrong. He gamely and cheerfully sings an original song and starts the celebration with an ode to Mickey Mouse. Walt Disney himself appears to remind us that "It was all started by a mouse," and that "Mickey is the real start of Disneyland." A montage of classic Mickey Mouse clips, including his debut in Steamboat Willie and the "Sorcerer's Apprentice" scene from Fantasia, unspool. Although it's great to see vintage black and white clips, this is the World of Color, and they can be distracting. The next scene pays tribute to Snow White and the Seven Dwarfs, the first animated feature. It segues into brief bits from a collection of Disney and Pixar movies, such as Bambi, Peter Pan, Cars, and Finding Nemo. When it adheres to the template established in the original World of Color and focuses on classic animated scenes, Celebrate shines. The show is more than a series of clips projected onto a water screen. By cleverly incorporating the fountains, lights, lasers, and other show elements, the presentation is a dazzling tapestry of color and spectacle. The animated scenes set the tone, but the fountains grab the spotlight. Using a variety of fountains, the show's designers have them gently swaying, soaring high in the air, playfully whipping to and fro, or performing other synchronized movements to stunning effect. The unsung heroes of the production may be the lasers. They imbue the fountains with rich hues of color and make them sparkle and shimmer. Frozen gets an entire sequence to itself. Although it's been overexposed, the movie's rousing "Let It Go" gets the full World of Color treatment to great effect. The precision with which all of the elements interact is quite remarkable. As the song hits its high notes, plumes of water shoot impossibly high while bathed in color and punctuated by lasers -- all in sync to the music. The combination of elements gives World of Color a surprising degree of depth. With the action happening on a variety of shifting planes, the show pops in a way that no 3-D film could ever hope to achieve. But when the action shifts to Disneyland, including vintage black and white clips and other live-action scenes, Celebrate falls a bit flat. I know that the whole purpose of this version of the show is to celebrate Disneyland's anniversary, but whenever Harris or Walt Disney talk directly to the audience -- scenes more suited for a television screen than a humongous water screen -- the production loses its momentum. And while it's cool to see some scenes from the latest Star Wars installment, they feel out of place and somewhat gratuitous. Celebrate ends with clips of guests having fun at Disneyland set to the wistful tune, "Forever Young." Again, it's wonderful to honor the park, but World of Color just doesn't seem like the right medium for this kind of footage. Don't get me wrong. World of Color is still an over-the-top, engaging show. And the Celebrate version features some nifty new effects including blasts of CO2 fog and a fireball of such megaton wattage, I thought the Anaheim Fire Department (or the Department of Homeland Security) needed to intervene. But future iterations of the show should probably stick with animation, and stay away from talking head clips. Disney refers to nighttime shows such as this as "spectaculars." Keep them spectacular. The world, after all, is a carousel of color. We want to hop aboard and see wild displays of wonderful, wonderful color.